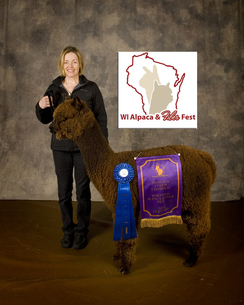 Monet is the result of the winning combination of McKala (key foundation female for Blue Ridge Alpaca Ranch) and Accoyo Marksman, multi-color champion fawn full accoyo. Monet has large, straight bone structure. Her bite and conformation developed perfectly. Monet's fleece is uniform in micron, color, bundling, has great density, and crimp. She has a fine handle. Monet would be an asset to ANY breeding program! Her full sibling, Marksman's Mecharios was exported to Canada, and was a Supreme Color Champion at 3 years old! Monet's lineage includes some of the most noteworthy animals in the alpaca industry, including; Timoteo, Hemingway, Express, Albus, Mariah, Heather's Acre Accoyo India, Tayberry, Vengador, Isis, Royal Fawn, Royal Avenger, DPA Mayflower, Kilyo of Star Hill, and Yupanqui. Monet gave us a fawn boy (July 12, 2018) by multi-chamption AVC AJ's Kodiak, named Impressionist. Thus, far, the little guy looks exceptional. Unfortunately, we did not get around to cria shearing him so he looks like a walking hay bale. Monet is calm, quiet and inquisitive. She knew exactly what to do with her baby and is very attentive. $2700 for Monet (without Impressionist). She can be bred to Soft Shinook, Heather's Acre Accoyo Sergio (white), Michelangelo's Awakening (brown), or Thunderbolt (grey) for no additional fee. 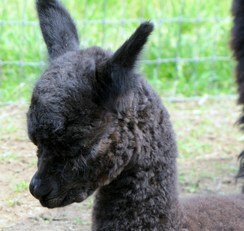 Or, we can get her bred to Millenium's Venture (at Oak Lawn Alpacas) for an additional $300.